Republican leaders in the U.S. House and Senate have come to a compromise on legislation that primarily aims to cut taxes for corporations and the wealthy. As part of that effort, the federal tax credit for electric cars was in limbo, but if an unnamed source who spoke to Bloomberg is correct, the credit has been spared. 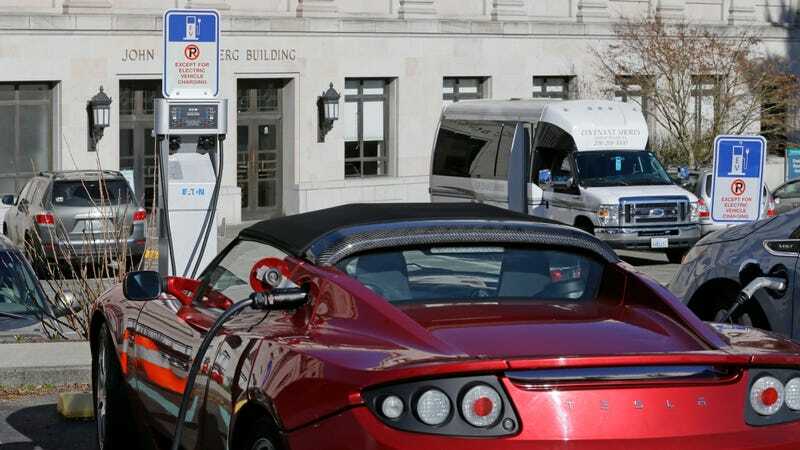 The House’s $1.5 trillion tax cut called for the $7,500 electric vehicle tax credit to be eliminated, but the Senate’s version of the bill—passed around 2 a.m. last Saturday—kept it in place. Legislators are working on a compromise bill that will be sent back to both chambers for a vote, and according to Bloomberg, the tax credit is going to survive. House and Senate negotiators have agreed to spare the electric-vehicle tax credit and wind production tax credit in their compromise package, according to a Republican familiar with process. As part of the $1.5 trillion House tax bill, the $7,500 electric-vehicle tax credit would have been eliminated and a the wind production tax credit would have been curtailed. The Senate bill didn’t do either, and that is part of the package set for release, said the person, who asked not to be identified discussing the details before the bill is unveiled. There’s not much to go off of, and the report hasn’t been confirmed elsewhere just yet. But if it’s accurate, the auto industry’s breathing a huge sigh of relief this afternoon. Automakers across the industry have rolled out ambitious plans for new electric models in the near future; the tax credit is seen as a way to attract newcomers to them who otherwise wouldn’t be interested. Electric cars currently make up only a fraction of the total market. Congressional analysts estimated that about $200 million could be saved over the next decade, if the tax credit was eliminated, Bloomberg reports. The $7,500 credit is available for the first 200,000 electrified vehicles sold by a manufacturer. At that point, the $7,500 is cut in half; six months after that, it’s halved again. Finally, the tax credit would be phased out. I’m sure the WSJ editorial board is weeping somewhere.